Metal corrosion inside of concrete is the number one cause of deterioration. Concrete is generally accepted as one of the strongest and most versatile building materials available. It’s so strong you can cut and drill into it without compromising its structural integrity. But, alas, concrete is not invincible. There are plenty of ways concrete can age and begin to deteriorate. 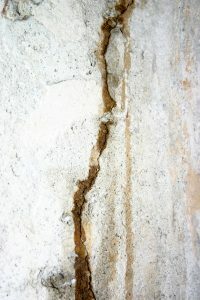 Here are the most common causes of concrete deterioration. Embedded metals, like rebar and post-tensioning cables, are the main cause of concrete deterioration. Since steel isn’t a naturally occurring metal it will naturally begin to corrode, forming rust inside of the concrete. This expansion of the materials creates stress in the concrete and causes cracking, delamination, and spalling. Since water expands when it freezes, any water that has seeped into concrete will cause damage when it freezes. The ice inside of concrete can make it expand so much that pieces of concrete can actually pop out. D-cracking, a type of freeze-thaw deterioration, happens when water accumulates in the base and subbase of pavements. When this water freezes it begins cracking the concrete from the bottom until it finally reaches the visible surface. One way to fight freezing is to use deicer chemicals. Deicers and other chemicals can damage concrete over time, causing it to deteriorate. Acids are particularly harmful to concrete since they react with calcium hydroxide in concrete and form water-soluble calcium compounds. Rain then washes away these compounds, leading to concrete corrosion. This entry was posted on Friday, November 18th, 2016	at 11:17 am	. Both comments and pings are currently closed.